The Mummies are an insane retro-1960's garage rock/surf punk revivalist band that came out in the early 1990's. Their sound is brutal and primitive, like the 1960's garage punk legends The Sonics even more hopped up on speed and flooded with distortion. The Mummies' music is pure and unbridled 1960's punk with a Farsifa organ, delivered with a energy that most punk bands wish they could have. 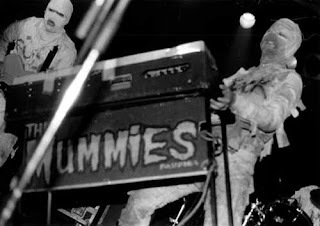 Of course The Mummies are a gimmick act of sorts...they perform live wrapped from head to toe in mummy bandages, bludgeoning their instruments. But so what? Performing both deadly instrumental tracks and songs with harsh acerbic voclas and lyrics, the Mummies are my favorite modern day 1960's punk act. Period. There are numerous Mummies releases out there. Many are hard to find. My favorite is the album "Never Been Caught"(1992), which is out of print. If you can't find that one, pick up "Death By Unga Bunga!! ", which is a compliation album of all their 45's. It is in print. Here's "Stronger Than Dirt" from "Never Been Caught". And here's a live performance of the instrumental "The Fly".